Microshocks are the phenomenon when a person gets charged in an electric field. When they touch a conducting object they discharge, and although the amount of charge involved is small, because that is concentrated on the small area of the skin where the contact is first made, it produces a sensation very much like the discharge you can sometimes get after walking across a carpet. See more on microshocks in general. One specific way this can happen is by riding a bicycle underneath a high-voltage power line. If you are in electrical contact with a metal part of the bicycle all the times, then no charge can build up between you and the bicycle, and you should not experience any microshocks. But if you are electrically isolated from the bicycle - e.g. you are holding rubber handlebar grips, or are wearing insulating gloves - then a charge can build up. This can then discharge as a microshock. The commonest place for this to happen is either on the fingers if they brush against the brake lever, or in the inside of the upper thigh, as it comes close to the top of the seat pillar just below the saddle or to the saddle rails once each pedal revolution. They are, however, completely avoidable, by the very simple measure of keeping a finger touching the brake lever (or the bare handlebar inboard of the handlebar grips, or a metal bar end, or any other metal part of the bicycle) for as long as you are under the power line. You don't need to grip it tightly, as long as there is a firm contact (if you only lightly brush your finger against the brake lever, you run the risk of getting microshocks at that point, which is the very thing you are trying to avoid). After dark, the microshocks may be visible as small flashes, less than a millimetre long. Again, this can be disconcerting if you are not expecting it, but there is nothing untoward about it; the energy in the flashes is very low, and it does not indicate any fault with the power line. If you experience problems on a bicycle under a power line that seem worse than the description here, please let us know as we would like to investigate. Should I expect a microshock every time I cycle under a power line? We've already talked about the particular conditions that have to exist between you and the bicycle. If you are completely insulated from the bicycle - holding rubber or cork grips - and there is nowhere for contact to be made - your saddle does not have any metal parts in the right place underneath, or you are wearing insulating shorts - then you will not get any microshocks (a charge builds up, but there is nowhere for it to discharge). Conversely, if you are in good electrical contact with the bicycle - holding a metal brake lever or touching metal bars - you will not get microshocks (no charge builds up in the first place). The power line needs to be high-voltage - usually 400 kV, or possibly 275 kV. More on telling the different types of pylon apart. It needs to be fairly low clearance, because that increases the electric field - more on the effect of clearance. And it probably needs to be warm dry weather - in humid conditions, the charges are more likely to leak away. 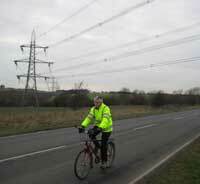 So, the vast majority of times, you will cycle under power lines without experiencing any microshocks at all. Are there limits related to microshocks?